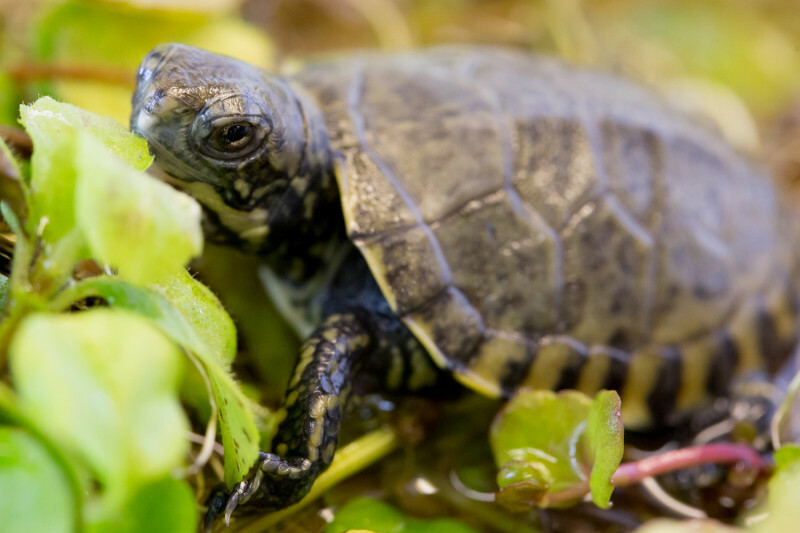 The Western Pond Turtle Recovery Project is a long-term, comprehensive program to re-establish and protect this endangered species in Washington state. Initiated in 1990 by Woodland Park Zoo’s former reptile curator, Frank Slavens, the program has helped reverse the fate of this native turtle, increasing its wild population from 150 turtles to approximately 800 today. Turtles are hatched at Woodland Park Zoo each year and reared here until they are large enough to avoid predation, then released into the protected habitats to help repopulate the species. Once ranging from the Puget Sound lowlands in Washington all the way to Baja California, the western pond turtle was essentially extirpated in the Puget Sound lowlands by the 1980s. This aquatic turtle lives in streams, ponds, lakes and permanent and ephemeral wetlands. While they spend much of their lives in water, they do require terrestrial habitats for nesting. In the few remaining locations where western pond turtles are found, they can be seen basking on logs, rocks or other floating vegetation. The initial decline in western pond turtle numbers in Washington was likely a consequence of commercial exploitation for food. Add to that loss or alteration of habitat, and the introduction of invasive bullfrogs and warm-water fish, and it was difficult for the turtle to recover on its own. Today, as a result of a collaborative effort between Woodland Park Zoo, Oregon Zoo, Washington Department of Fish & Wildlife, and U.S. Fish and Wildlife Service, the western pond turtle is making a comeback in the state. 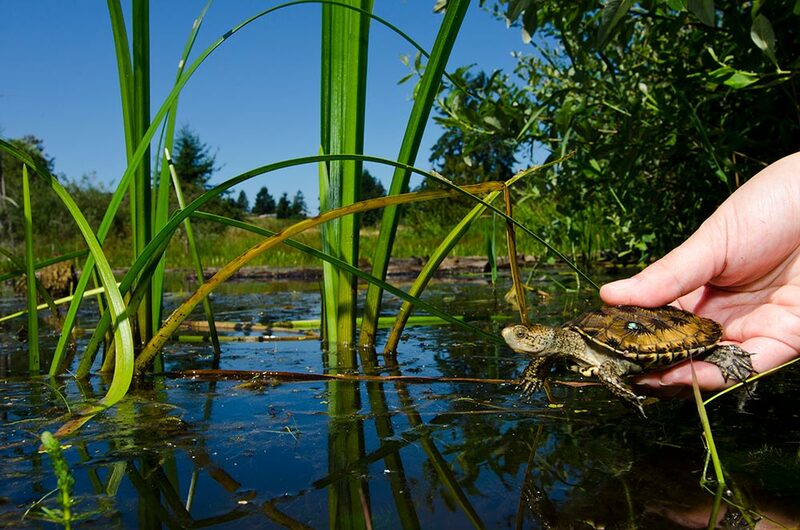 In the fall of 2012, key stakeholders involved in the Western Pond Turtle Recovery Project met in Olympia for a Population and Habitat Viability Assessment (PHVA) workshop. A PHVA involves reviewing detailed data on species biology, genetics and ecology, integrated with estimates of human-based threats. This information is used to evaluate the risk of wildlife population decline or extinction under alternative future management scenarios. The models are an excellent tool for the western pond turtle stakeholders to make better decisions about species conservation. Non-native bullfrogs are a major threat to young turtles, eating up the quarter-sized hatchlings. To reduce predation by bullfrogs, the project removes bullfrog egg masses from protected sites. From 1990 to 2000, no 2- or 3-year-old turtles were ever seen in the wild. Due to these eradication efforts, we are now beginning to see this age-range of wild born turtles. Do You Live Near Wetlands? If you are interested in reporting a Western pond turtle sighting or believe your property may be a good recovery site, visit our FAQ for more information about wild turtles and how you can assist Washington Department of Fish and Wildlife in their recovery efforts. The western pond turtle (Actinemys marmorata) has been known as the Pacific pond turtle, western mud turtle, Pacific mud turtle, Pacific terrapin, and Pacific freshwater turtle. Typically a medium-sized turtle, with color varying geographically and with age, turtles in the northern part of the range are darker in overall coloration. In general, females have smaller heads, less heavily-angled snouts, relatively higher and rounder carapace, and thinner tails. Living up to 50 years, female turtles begin reproducing between the ages of 8 to 12 years old, digging shallow nests to lay a clutch of 2 – 13 eggs. Each spring, project leaders and volunteers live-trap turtles in the field, fitting adult females with transmitters in order to track them to their nests later in the season. After several months, volunteers and project leaders return to collect the eggs and any young turtles that have hatched, taking them to WPZ or the Oregon Zoo for head starting. Despite the population increase success over the past 20+ years, project managers are concerned about continued predation threats from invasive bullfrogs and limited habitat availability for population recovery. Each year eggs are brought to Woodland Park Zoo and Oregon Zoo from protected ponds located in Washington state. The eggs are incubated in special boxes under controlled conditions until they hatch, then the baby turtles are head started for eight to 10 months until they reach a size too large for most predators: bullfrogs, raccoons, mink and warm-water fish. At that time the turtles are examined by veterinary staff, some are fitted with transmitters, and they are released to their previous home site.